Reflecting on 2011, I began thinking of the 5 events in biotechnology that were the greatest threats to the sanctity of human life. True to my mission though, I couldn’t just talk about what is bad in the biotech arena. I also have to celebrate the 5 ways biotechnology has improved or preserved human life. In 2011, there were more ways human life was marginalized than a pro-life person could possibly count. I focused on 5 events that I believe will continue to threaten the sanctity of human life in 2012 and beyond. This year researchers in England announced they created human embryos with three genetic parents in an attempt to prevent the inheritance of mitochondrial disease. Scientists created 2 embryos with IVF, destroyed one embryo by removing its nuclear DNA and added the DNA from the other human embryo ultimately creating a hybrid embryo with DNA from two women and one man. (Confused? Here is an illustration.) Scientists want to start implanting these genetically engineered human embryos in 2012. Curing genetic disease is a laudable goal, but destroying human embryos for parts to make other embryos disease free is not the way to do it. In 2011, scientists at the Mayo clinic announced they made a glow-in-the-dark kitty. 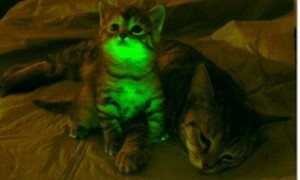 This is not the first time scientists have made cats glow with the green fluorescent protein. But these kitties were different. In the past, transgenic cats and other glow-in-the-dark animals were made by SCNT better known as cloning. These illuminating cats were made instead with a tweak on plain old in vitro fertilization or IVF. Researchers modified the egg and then fertilized it with regular sperm. This modification was shown not only to be incorporated into the first generation kitty, but for the second generation as well making it a technique that produces germ-line genetic modifications or modifications that can be passed on from generation to generation. This was the first time this technique of modified IVF was successful in carnivores. Why are these kitties part of the worst? Their creation is not necessarily unethical but they point to possible unethical experimentation in humans. In the past the prevailing wisdom was that before we could genetically modify humans we needed to perfect human cloning. These cats prove that it may only take modifying eggs or sperm before IVF to create a genetically modified human that could pass that modification onto his or her offspring. With IVF being such an accepted and widespread practice, it may not be long before parents are ordering up germ-line genetically modified offspring that will have no choice but to pass their modification on their children and grandchildren. This year we were introduced to the ugly practice of selective reduction, a euphemistic term that describes the killing of one fetus in a multiple pregnancy. Selective reduction is becoming more commonplace because fertility treatments like IVF are creating more and more multiples and doctors are advising patients to “reduce” their quadruplets, triplets and even twins down to a more “manageable” size. In 2011 the world discovered the truth that abortion is the “safety net” for IVF. No matter the failures, scientists are still trying to clone humans. Researchers in New York purposefully created embryos with a devastating genetic disorder called triploidy in their attempts to master human cloning. And Professor Park Se-pill at Jeju National University in South Korea has picked up where disgraced cloner Hwang Woo-Suk left off and is now trying to be successful at cloning a human embryo by 2015. What? Captain America? What does a movie about an awesome super hero have to do with dangerous biotechnology? Alright, I admit a movie isn’t technically biotechnology but hear me out. Captain America is the perfect, palatable example of transhumanism, the most dangerous movement that no one knows about. Transhumanism seeks to use technology to transform humanity into something other than human, the “transhuman” meaning “beyond” human. Artificial limbs, cognitive enhancing drugs, genetic engineering, artificial intelligence, and nanotechnology are tools not to heal the sick and injured but to create the transhumanist’s perfect technological utopia where being human just won’t be good enough. You must be enhanced. The reason Captain America is so dangerous is because he is the perfect poster child for transhumanism. Captain America is the only super hero that I know where the enhancements are a choice. The Hulk and Spiderman were accidents. The X Men were born that way and Superman is from another planet. The Green Lantern has a ring that he can take on and off and Ironman has a suit, so their enhancements aren’t permanent. But in Captain America, everyday American Steve Rodgers was experimented on to make a better soldier to help win a war. He was healthy and underwent potentially fatal procedures to make him Captain America, placing in the subconscious of every boy and girl in the United States that the way to become a hero is to volunteer to let your government experiment on you. Totally unethical and totally dangerous. And now for the most promising events in biotechnology that affirmed human life in 2011. Researchers can now take a cell like a skin cell and reprogram it back to an embryonic-like state creating cells that can be used ethically to research disease. No embryos needed. These induced pluripotent stem cells really came into their own in 2011. The Scientist even called them biology’s new super model. Gene therapy, the good kind of genetic engineering, had some great advances in 2011 giving hope to those who suffer from chronic pain,osteogenesis imperfecta, and sickle cell anemia, among others. In both Europe and the United States movements where successful in preventing the patenting of human embryos. These were small, but important, protections against the further commodification of the smallest of human lives. This year the Vatican put its money where its mouth is and partnered with Neostem, an adult stem cell company, in creating a non-profit foundation focused on fund raising, education and putting on an adult stem cell conference in Rome that took place in November. IVF is not the best nor the only treatment for infertility. NaPro Technology has been around for decades, but 2011 saw a rise in awareness about thisethical and effective alternative to IVF for infertility. NaPro Technology looks at the underlying causes of infertility and treats them giving infertile couples hope for children without creating and destroying human embryos in a lab. Besides being natural and ethical, the best part of NaPro Technology is once the cause of infertility is identified and treated, couples can get pregnant again and again.